Biotechnology by Open Learning: Biosynthesis and the Integration of Cell Metabolism focuses on the structure and activities of cells, including nitrogen fixation, biosynthesis, and metabolic pathways. The manuscript takes a look at precursor molecules for biosynthesis, uptake of nutrients, and nitrogen and sulfur assimilation. Discussions focus on the importance of nitrogen fixation in nature, assimilation of sulfate, ammonia, nitrate, and molecular nitrogen, passive diffusion through protein channels, nutritional requirements of cells, and membranes as permeability barriers. The book then explores amino acid and nucleotide biosynthesis and biosynthesis of lipids. Topics include commercial importance of polysaccharides of micro-organisms, biosynthesis of disaccharides, oligosaccharides and polysaccharides, occurrence of carbohydrates in living systems, and metabolic links between amino acid biosynthesis and the biosynthesis of purines and pyrimidines. 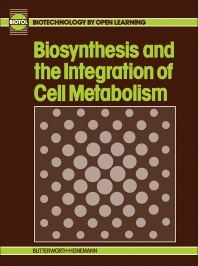 The text examines the integration and regulation of metabolism and control of metabolic pathway flux, including patterns of regulation of metabolic pathways, coupling agents in metabolism, integration and regulation of metabolism, and maintenance of metabolic homeostasis through energy coupling. The manuscript is a valuable source of data for biotechnologists and researchers interested in biosynthesis and integration of cell metabolism.